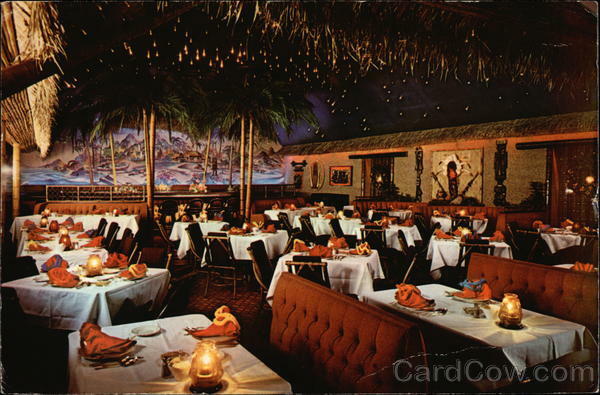 One of the fancier restaurants that I remember going to with my family in the 1970s was the Hawaiian Cottage in Cherry Hill. Though you had to get dressed up (remember when people got dressed up to go out to dinner? ), these outings at least promised fun in the form of hula dancers and a dinner show. Route 38 in decidedly non-tropical New Jersey was an unusual location for a restaurant with burning tiki torches beckoning you to come in for a bite. The Hawaiian Cottage, with its yellow, pineapple-shaped roof, was quite the whimsical landmark. Long before Disney and other establishments like the Rain Forest Café amped up dining with elaborately themed restaurants, the Hawaiian Cottage transported its patrons to an island paradise for a few hours. The description on this undated postcard promised an authentic Polynesian atmosphere and a new show every week. Image courtesy of Card Cow. The Hawaiian Cottage was often the destination to celebrate milestone birthdays, anniversaries, proms and other events. 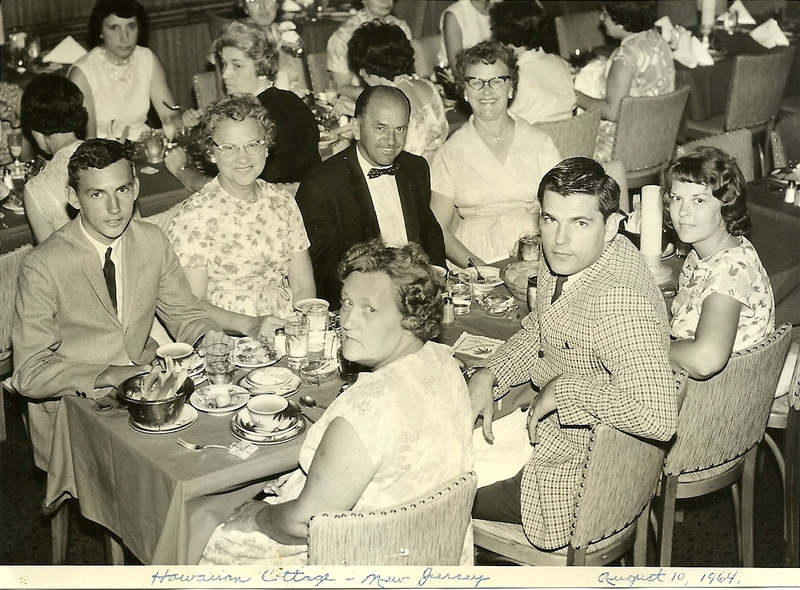 Many Philly area natives have glossy souvenir photos from bygone days at the Cottage, in which they and their relatives, dressed to the nines, struck their best celebrity poses to mark these occasions. Walter “Joe” Jowell of Philadelphia celebrates his 50th birthday in style at the Hawaiian Cottage in 1964 with his family. Mary and Michael Egidi established the Hawaiian Cottage in 1938. Its inspiration reportedly came from the Hawaiian performers at Steel Pier in Atlantic City, where Mary Egidi spent summers as a child. After Michael died in a car accident only a few years after the Hawaiian Cottage opened, Mary kept the business going and later her second husband, John Muresan, helped to grow the business. The Hawaiian Cottage grew in popularity along with Middle America’s interest in tropical island culture, which was brought to the forefront as Americans served in the South Pacific during World War II. All things Polynesian got additional attention when Hawaii became the 50th state in 1959. And as Cherry Hill blossomed as a destination in the 1960s, with people headed to Garden State Racetrack or the Cherry Hill Mall, the Hawaiian Cottage had plenty of patrons. This 1955 postcard noted the Hawaiian Cottage offered “Unexcelled food in an enchanting atmosphere of the Paradise Isles of the Pacific.” Image courtesy of Card Cow. During their tropical island escape to the Hawaiian Cottage, patrons were treated to a luau stage show with dancers performing in grass skirts. I remember being one of audience members invited up to learn the hula. 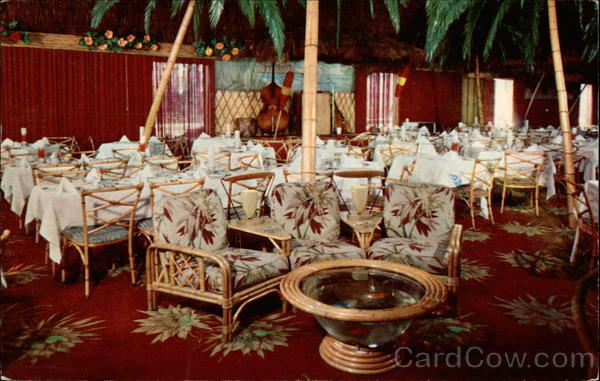 As the cold realities of the 1960s and 1970s chipped away at fantasy worlds, tiki bars and restaurants began to look a little dated and kitschy. The Hawaiian Cottage survived until 1978 when a fire spelled its end. Although an Olive Garden restaurant now occupies the site, it will likely never occupy the minds of former Hawaiian Cottage patrons in the same way that its restaurant predecessor does. Did you learn to hula at the Hawaiian Cottage? What special occasions did you celebrate there? Share your memories in our comments. Please share your memories of the Hawaiian Cottage. My father, Albert Cabrelli, was in the orchestra a few years and I remember as a child going to rehearsals with him, I believe on Tuesdays. Years after my father left the Cottage, he helped me get a reservation for New Years eve 1967. The owners were terrific.